"Build it and they will come." This line from the movie, "Field of Dreams," represents one of Roy Peterson's missions: to provide free accessible, ice for Grande Prairie kids. During the 1950s, Roy could often be found operating the City's fire truck to flood local outdoor rinks where local kids skated, ragged the puck and played pick-up hockey. It was over coffee with Roy that RCMP Staff Sgt. Bill Shaw discussed the problem of limited ice rinks for minor hockey and he proposed that a location on the Bear Creek Flats near the heart of town would be the ideal location for an accessible facility. The idea became Roy’s obsession and in 1957 he pledged to make the dream a reality. Local businessmen provided a shack, material for boards and Alberta Power set up lights and provided power. Bill and Roy along with Harold McKay, Max Henning, Ernie Radbourne and Fred Dobyn were among the volunteers who gave substance to the dream and two rinks materialized on the Bear Creek Flats. For years these rinks teemed with activity supporting organized hockey, informal scrimmages and leisure skating for children and adults. Today’s thriving Minor Hockey program with full time staff grew from the humble but highly successful minor hockey program at the open-air rinks on the Bear Creek flats. Kids eager to play, and during the first season there were 248, placed their names on a sign up sheet stapled to Roy Peterson’s back door. The fee was $1.00 per year (if you had the money) and if a “would be” hockey player needed equipment it was provided. No one was denied the chance to play. By the first face-off the 248 minors were assigned to twenty-two teams. Seventy-five volunteers served as coaches, assistant coaches, referees and behind the scenes workers. They are all heroes but major credit goes to Hockey Legend Roy Peterson for implementation of a dream. In addition to his role as a builder of hockey infrastructure, Roy coached for thirty-three years. As a coach he was dedicated to teaching teamwork and fair play. He was driven by the conviction that to bring out the best in your players a coach needs to catch them doing something good and reinforce that behavior. He was a powerful positive influence. His coaching expertise was rewarded in 1972 when his Bantam Barons won the Provincial Hockey Championship. 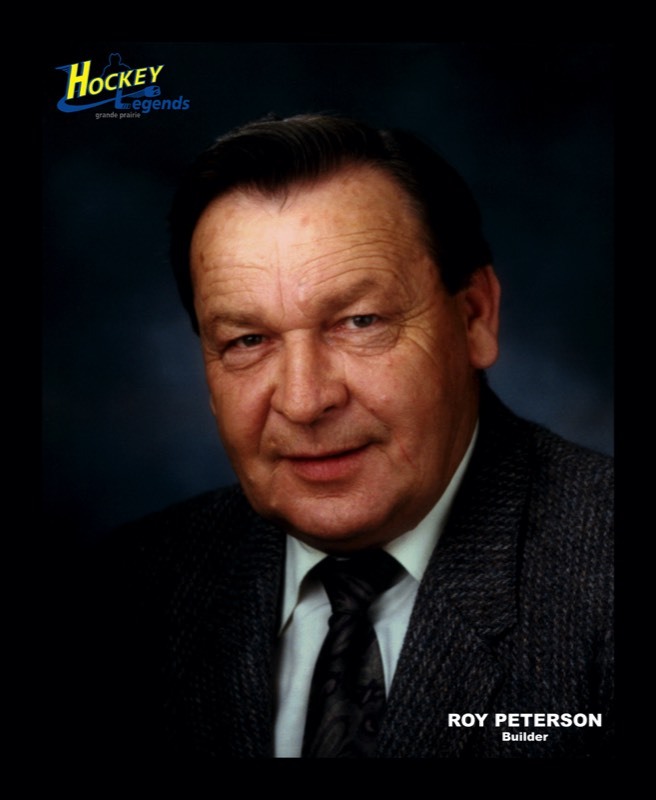 Roy Peterson- a Grande Prairie Hockey Legend in 2004.